For anyone who has ever struggled with a marriage that isn’t working, for those who feel the lingering pain of abuse, for those who struggle with a life that’s out of control, The Gift of Transformation is a road map to hope. I wrote it to tell my story, but I believe that all of our stories are connected at a deep level, and the Jesus who met with me stands ready to meet with you. Some experiences change our lives forever. Those of us who have had a profound experience with God know what it’s like to awaken in a new world where everything has changed. The old dreary depression is lifted, the gnawing anxiety is gone, the people who used to aggravate us suddenly don’t bother us any more. Jesus is here; and though our circumstances may not have changed one bit, we find ourselves surveying the old bullies of our lives with a confident smile. You might be in the same place I found myself: a Christian for many years, trying to please God, but struggling with a faith that couldn’t cope with the Goliaths of my life. If you hope against hope that there is more, but secretly wonder where it is and how to find it, this book points the way. It really isn’t all that complicated. It just takes a little courage. Read and enjoy; drop me a note and tell me your story. 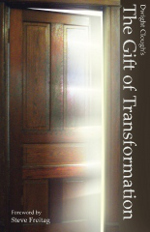 The Gift of Transformation is a quick read; an easy read. However, the depth of its content and meaning will surprise you. … This book will help you make the choice to start your own soul-healing search with [Jesus Christ]. When we talk about a changed life, people imagine many things. Some imagine setting goals and working hard. I admire people like that. But you can’t get this by working hard. Some imagine days of fasting, sweaty prayer meetings, shouting hallelujah, and calling down from heaven fire. But this doesn’t work that way. This is easier, much easier, and harder, much harder. Because it only takes one thing. Oh, yes. I need to tell you it will take courage to read this book. This second printing contains a new foreword by Steve Freitag, Director of CrossCounsel International Ministries.